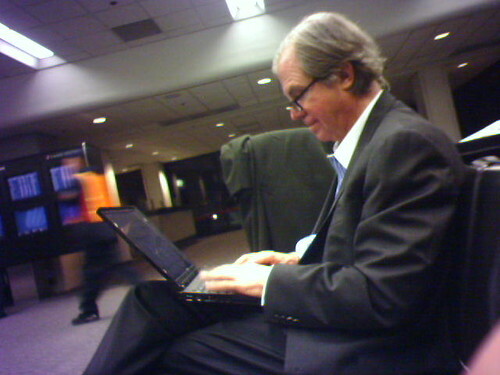 According to Brainy History, Nicholas Negroponte turned 64 over the weekend. I hope he got a good weekend's rest from his world travels promoting the wildly innovative XO-1 laptop for children in developing countries, and strategizing the Give One Get One program where consumers in the U.S. and Canada can donate a laptop and get one themselves. Even though I have two prototypes, I ordered my production units as soon as the offer went live on the morning of November 12th. Nicholas is pictured above in a phonecam shot I made at SFO for a moblog entry on my way to the TED 2006 conference. Nicholas was to speak on the first day of the conference and was waiting for the same prop plane as my (then) boss Mark and I were taking for the final hop to Monterey. As is apparently the norm, he was answering emails on his IBM laptop in keeping with his legendary swift responses. I introduced myself as my company's liaison to the Media Lab and he gave a knowing smile saying he had heard that our sponsorship was about to lapse, but asked us to hang on a minute while he finished his email. Closing his laptop on a folded Wall Street Journal, Nicholas said that he had just come from London by way of New York. He said he was circling the globe every three weeks, travelling over 300 days a year single-handedly promoting the project. I was amazed that he only had a small rollling case and laptop bag in tow, but I remembered reading in a magazine about how he travels really light by FedExing his laundry to and from desintation hotels. We chatted about how we needed to jump through some hoops with a reluctant division Vice President to get our sponsorship renewed (we're renewed now). Nicholas offered to help, and furthermore said he could pay us a visit while in DC the following Tuesday to talk about the laptop and pitch our bosses. We said we'd pull out the stops to schedule a meeting. 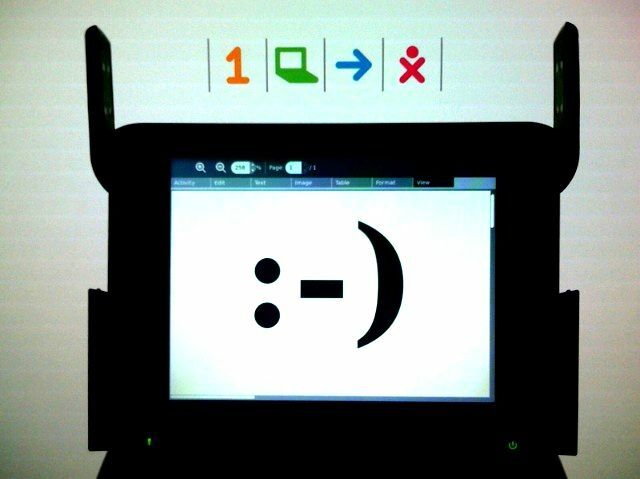 He scribbled some notes on one of the standard Media Lab-logoed 3x8" paper scratchpads. Since that day, aside from countless news articles and videos, I've seen Nicholas in person in a few meetings and also saw him whiz by at Boston's Logan airport coming off the shuttle from DC as I was getting on. I've often thought about the kind of drive it takes to take on an insanely grand vision such as equiping 150 million children across the planet with ultra low cost, yet technologically advanced laptops. Day after day fending off naysayers and would be slayers has got to take a toll. And not to mention electing to travel over 330 days a year. But on his 64th birthday Saturday, while hopefully getting some rest, Nicholas had a lot of wonderful presents to charge his spirit: he had extended the Give One Get One offer until the end of the year because of vigorous sales and widespread interest (really a gift to us), the first batch of production laptops were deployed in Uruguay and several hundred thousand new orders came in from prospective countries. I imagine that at 64--maybe humming the famous Beatles tune--all those nights staying up until quarter to three debating implementaion details, going for rides to the airport on Sunday mornings, scrimping and saving to ensure there was enough money for mass production and trying to convince several hundred million consumers give him an answer of "yes" all seemed worth it. He has pallette-fulls of shiny new laptops with which to change the world. Happy birthday Nicholas. You're growing old in grand style!